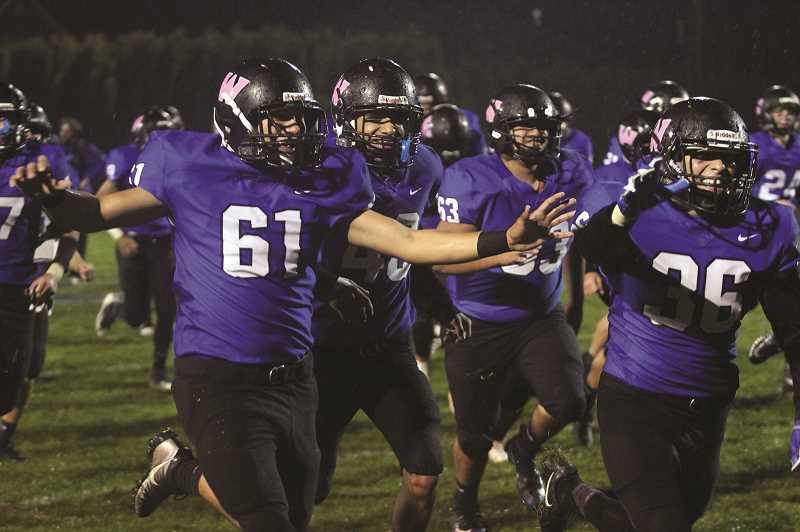 The Woodburn football team made program history on Friday night, defeating the visiting Tillamook Cheesemakers 18-13 to put the team back in the state playoffs for the first time in 44 years. In what has become a regular occurrence this season, the Bulldogs (6-3, 2-3 Special District 2) left the final result unresolved until the last minute, giving up a late touchdown to the Cheesemakers only to storm back to score the game-winning touchdown with 1:07 remaining. "This is a testament to what we've been doing all year and the type of heart we have," senior quarterback R.J. Veliz said. "We have more heart than anybody in the entire state and it was just proven right here. I just love my brothers to death." Woodburn held a 12-0 lead over Tillamook after the first two quarters of play, but the visiting Cheesemakers rallied in the second half, scoring on their opening drive of the third quarter on a one-yard touchdown run from Chris Silveira to cut the deficit to 12-7. The Mooks held firm throughout the second half before finally taking the lead with just over three minutes left in the contest, scoring a touchdown on another Silveira dive to go up 13-12 and put the Bulldogs in a do-or-die corner. "We had three minutes and at that point, we had nothing to lose," Veliz said. "Everyone in the stands were probably like, 'They lost again,' but that's what kind of drove us. We ran hard as heck." Woodburn drove down the length of the field, largely on the back of Veliz, who broke free for several big gains, the last of which he took 30 yards for the game-winning touchdown. After the score, Veliz credited the open lanes he was able to utilize to the play of backfield teammate Dyontae Navarrete, who led the team in rushing with 120 yards on 23 carries. "Dyontae ran so hard and that opened up the keepers for me, because he was running so hard they had to key up on him," Veliz said. Navarrete also scored the Bulldogs' first two touchdowns of the game, a two-yard plunge in the team's opening drive and another two-yard scoring dive at the end of the first half. But there was still plenty of time on the clock for the Mooks to answer after Veliz's touchdown. Silveira took the ensuing kickoff and returned it to midfield where he was stripped of the ball. Sophomore kicker Cole Beyer was there to pounce on the loose fumble, securing the turnover and effectively ensuring the victory for Woodburn. It was the fifth consecutive game in which the result was determined by a single score. Woodburn lost back-to-back games in the middle of the season by scores of 14-12 and 14-13, and followed with a 14-12 win over Crook County on Oct. 11. The Bulldogs dropped their third game of the season, a 30-28 home loss to No. 2 Gladstone in its regular season finale. In total, Woodburn's three losses have come by a combined five points, a stat not lost on the Bulldogs. 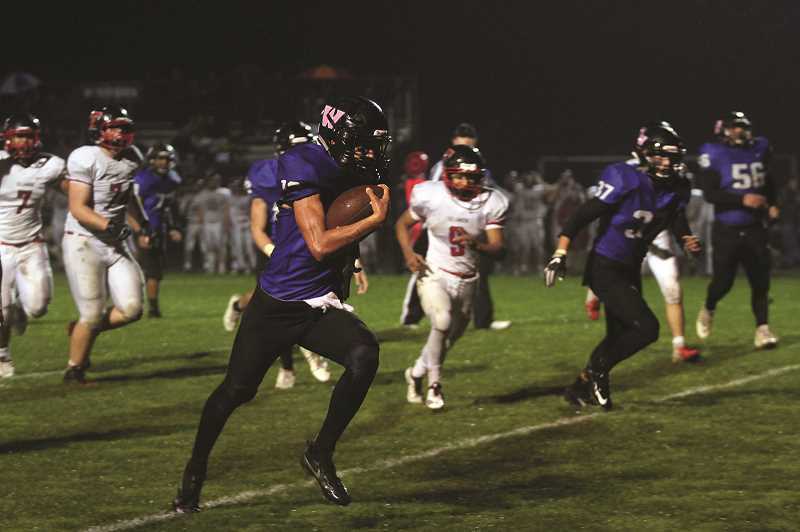 "I think that gives us more confidence because it just shows that we're one play away in each game from being undefeated right now and being a top three team in the state going into playoffs," Veliz said. "So that just gives us confidence that we can beat anybody in the state." Woodburn racked up 216 of their 285 yards on the ground courtesy of Navarrete and another 97 yards from Veliz, most of which came on the Bulldogs' final drive of the game. Woodburn opens the state playoffs on Friday at No. 5 Mazama (6-1, 4-0 Special District 5) on Friday, and the Bulldogs are looking to continue their historic run and finish the upset they nearly had against Gladstone earlier in the year. "Just to be able to do this with guys I have grown up with (since) kindergarten and preschool, it's just an incredible feeling," Veliz said. "I would take all 50 guys in our program over anybody else in the state. No one else puts in the work we do. We're family." Woodburn (8:14) -- Dyontae Navarrete two-yard touchdown run. Point after attempt no good. Woodburn (0:18) -- Dyontae Navarrete two-yard touchdown run. Two-point conversion no good. Tillamook (8:25) -- Chris Silveira one-yard touchdown run. Point after attempt good. Tillamook (3:15) -- Chris Silveira one-yard touchdown run. Two-point conversion no good. Woodburn (1:07) -- R.J. Veliz 30-yard touchdown run. Two-point conversion no good.